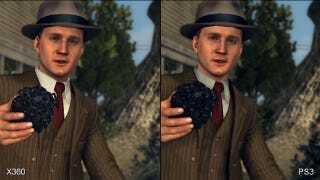 Which Console Does L.A. Noire Better? Multi-platform video game lovers sometimes face hard choices. But it appears that the decision to play Rockstar Games and Team Bondi's L.A. Noire is a relatively easy one, based on a side-by-side analysis of the PlayStation 3 and Xbox 360 game. Many L.A. Noire buyers probably made up their mind to purchase one or the other based on the game's disc count—three DVDs on the Xbox 360, one Blu-ray on the PS3—but if performance is a bigger issue than getting off the couch for two disc-swaps, Digital Foundry dived more deeply into things like framerate, shadowing and lightning. The result? The PlayStation 3 version appears to come out on top on just about every account, with the Xbox 360 seemingly getting the shorter end of the stick on things like frame rate and streaming performance. Digital Foundry offers copious comparison video and screen shots, should you be still on the fence about which version to purchase.